Located in Southern Africa and straddling the borders of Zambia and Zimbabwe, Victoria Falls is teeming with exciting history and little known facts that shaped the region into what it is today. Visitors from around the world will go out of their way to admire the 355 feet high monolith of a waterfall, some even braving the edge to get an incredible view of the land. 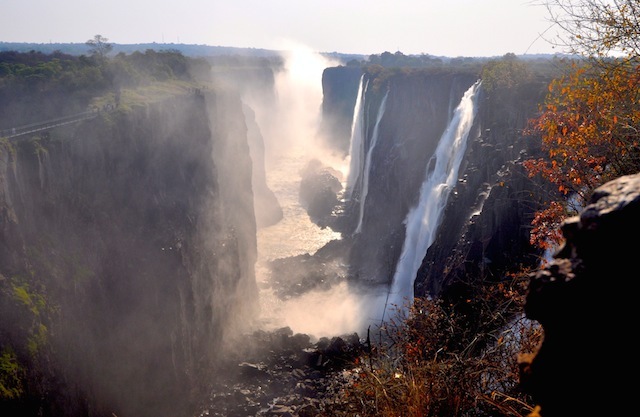 Here are some cool things you probably didn’t know about Victoria Falls. Archaeologists have unearthed stone artifacts dating back to early stone age (around 12,000 BC). The stone artifacts were tools used by the ancient people to crack open nuts or kill animals. It’s speculated that the early humans stayed in Victoria Falls due to its prominent location and abundance of wildlife that it attracts. It wasn’t until 1855 when David Livingston, the first European laid eyes on the falls, renaming it after Queen Victoria. They say “when pigs fly” but it really should be “when you’ll see the bottom of Victoria Falls.” It’s absolutely impossible to ever glimpse the bottom of the falls where the water meets the rocks. The enormous amount of water continuously dumping against rocks creates eternal fog. Water also ricochets off the rocks, completely shrouding the bottom with spraying liquid. Because of the violent impact on the bottom, it’s strongly advised to not explore the bottom (only on the top) of the falls. There’s a small portion on the top of the falls that’s considered “safe enough” to go swimming and float near the edge. The Devil’s Pool allows swimmers to get a peek downward, getting a one-of-a-kind view of the water plummeting toward the earth. It’s only safe to swim there during dry season (September to December) when the current slows down, making it easier for daredevils to further explore the falls. If swimming towards the edge doesn’t put some hair on your chest, then free-falling off the top of the falls will. A bungee jumping station is at the top of Victoria Falls Bridge and is run by Zambezi Adrenaline Company. Brave participants can opt to jump head first alone or buddy up with a friend or a skilled jumper before making the leap. Scottish celebrity, Ewan McGregor praised the activity at Victoria Falls after making the jump himself. How many times can you say that you’ve looked down (yes down) to see a full rainbow? Because of the eternal mist surrounding the falls, rainbows are formed as the moon bounces off light into the water during sunset, creating a Kodak moment. Come during sunset hours (preferably on a full moon night) and you’ll witness a strong, illuminating rainbow hovering over the mirage of the bottom of the falls. In some cases, rainbows can be seen vertically. Walk for a mile to get an idea of how big this waterfall is. The width is over a mile wide during wet season when stronger current gushes more water over the cliffs, creating a wider overflow. During its wet season, tourists are warned to steer clear of the falls and are permitted to visit during the dry season when the current isn’t as forceful. For visitors that wish to go hiking and explore more of the wilderness, Zambia has more trails. 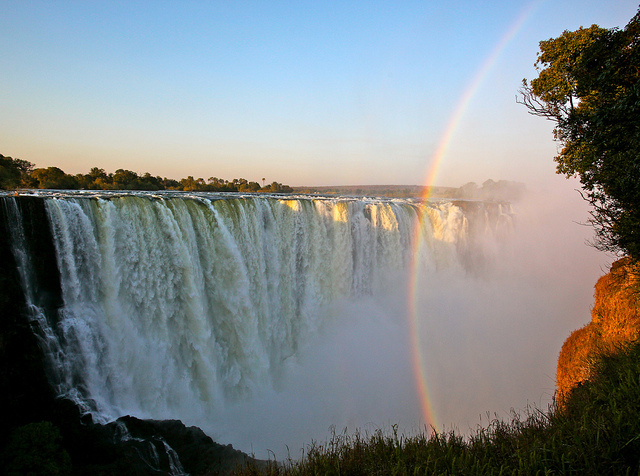 However, from Zambia, you’ll only catch partial views of the falls. From Zimbabwe, you can see almost all of the falls but there are less trails to explore. It’s advised for tourists to visit both sides to get a dose of both nature exploration and a scenic view of Victoria Falls.